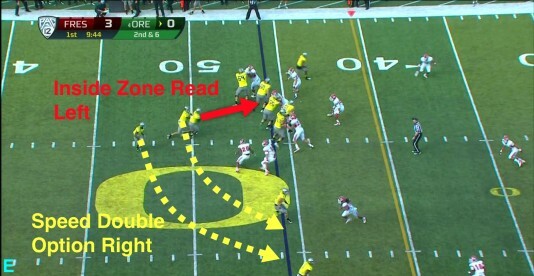 The big wins do more for the next level Oregon fan than simply allow us to watch the fun plays and eye the reserves. 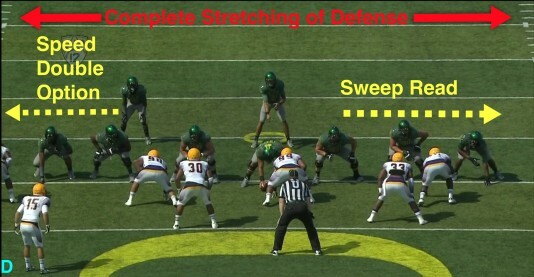 Sub-division teams like Tennessee Tech may not provide a fair assessment of the 2012 Oregon Ducks team, as Fresno State has been the only team to offer up much resistance if any against the starters, but these first games have given an opportunity to learn about an important play series emerging, and the new wrinkles that are clearly taking a larger role in the Duck playbook than in prior years. Chip likes to utilize his personnel to their unique strengths, so let’s see how he does it with Oregon’s new Straddled Triple Option Combo Series! Remember that I call it the Straddled Triple Option because Oregon attacks a defense in both directions, unlike the normal triple options executed by other teams that flow in one direction. Which direction the play develops depends on the quarterback’s read of the defense. On the play seen above Oregon attacks in the direction of the Sweep Read, as Tyler Johnstone and Hroniss Grasu pull and make tremendous blocks on the outside. 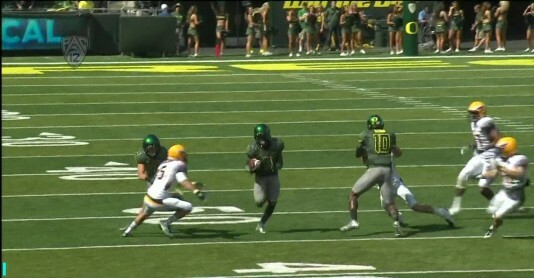 Oregon also has superb sealing blocks to the inside by Ryan Clanton and freshman Pharaoh Brown at the tight end spot. On the outside there are great blocks by the wide receivers – Rahasaan Vaughn and Dwayne Stanford. 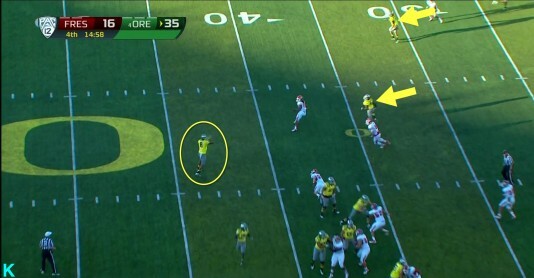 We know the end result of this run, De’Anthony Thomas bursts into the open field (above) for the Touchdown! It was exciting to see this new wrinkle back in the Straddled Triple Option, and to see such tremendous blocking by the offensive line and wide receivers. Looking at the six who made the crucial blocks? Four of them were VERY young, including two true freshmen, one redshirt freshman, and a sophomore. Wow! 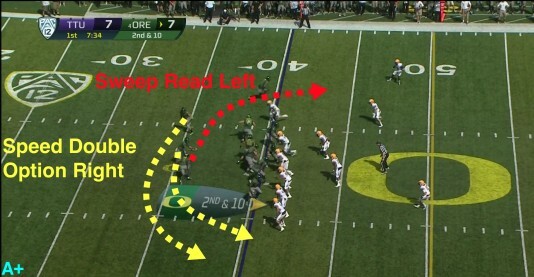 The image above illustrates better the dilemma defenses must face when this play is used. Pulling linemen will be moving to the defense’s right, and defenders must react to defend the perimeter or else De’Anthony Thomas may break into the open for a long touchdown. This particular combination package in the Straddled Triple Option has to be the most lethal in stretching a defense out, creating big running lanes, and exposing the slightest mistake immediately. Truly a nightmare for Defensive Coordinators! For comparison purposes, it helps to see how the Straddled Triple Option is typically run in the image above. This shows a Speed Double Option going right with the QB and RB, and an Inside Zone Read option to the left. Since the defensive end being “read” is NOT charging the RB, or instead is “sitting,” then the correct read is for the QB to hand the ball off to the Running Back, resulting in one additional blocker on the side the play is now going towards. A hat-on-hat for each of the defenders results in Kenjon Barner (above) popping through the line of scrimmage, picking up a big gain from the Inside Zone Read option of the Straddled Triple Option. Now things start to get much more amusing, as we see another use of the Straddled Triple Option above, but this time it is an OUTSIDE Zone Read option going to the left. The perfect shoulder turn by the offensive linemen indicates that the play is an Outside Zone Read to the left side. However at the same time De’Anthony Thomas is taking off to the right and would be out of range as the pitch-man on an option; what gives? Now look at this variation in the image above–rather than an option pitch-man, now De’Anthony Thomas becomes a receiver on a bubble pass. Yet it is still a Triple Option with an OZR to the left, with added QB keeper or Bubble pass options to the other RB (Thomas) to the right? What an interesting variation to the Triple Option formation and set of plays! This play scored a touchdown as well, as the defense flowed to the opposite side of the field to cover the zone read, and tremendous blocking set up on the outside springs De’Anthony Thomas for a long run. With this same formation Oregon gets either a touchdown to the left on the Sweep Read, or a touchdown to the right from the Bubble Pass? These two plays epitomize the vast stretching from sideline-to-sideline that the Chip Kelly Spread Offense places on defenses, and how great blocking opens up huge lanes for all Oregon’s talented and speedy players to exploit. We love it! In the play above, Oregon lines up vs. Fresno State in the Straddled Triple Option formation again and runs a play-action pass. Here we see an Outside Zone Read going to the right with a perfect shoulder turn by the offensive linemen, and quarterback Marcus Mariota appears to run the mesh with the running back in the backfield. Instead Mariota pulls the ball out from the mesh point to keep it and rolls left, with two receiving options to the left side of the field. It’s another variation to dramatically stretch the defense once again. 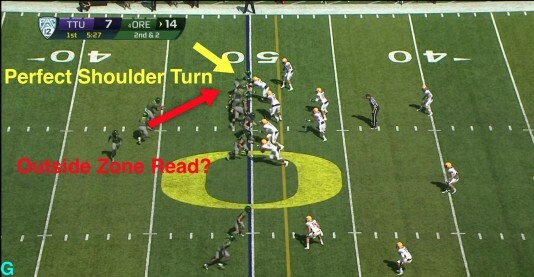 Against Chip Kelly’s offense any defensive hesitation results in giving up big plays, and with all these variants of the same formation, how can defenders not hesitate waiting to see which option Oregon is using to attack this time? I have been amazed at the many variations of the same formation and play that Chip heaps upon a defense, and this doesn’t even count the “Lead Sweep” play, also utilized from this same formation. 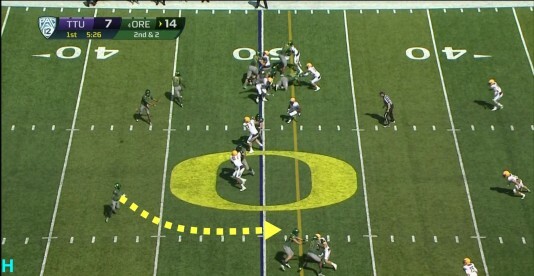 The Oregon offense puts a defense into a position of not being able to cover just one side or the other, or even recognizing if the play is a run or pass until it is too late. 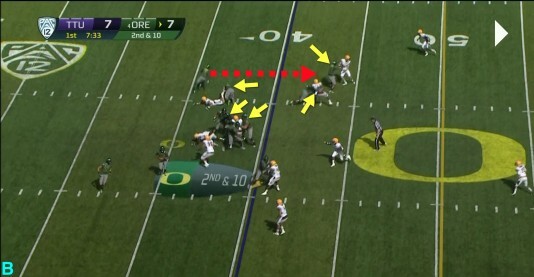 This new Straddled Triple Option Combo series is ideal with the current personnel on the Ducks roster, players with so much speed it’s dangerous; but add a hesitant defense trying to figure out what is going on and that split second of reaction is enough to give athletes like Thomas or Barner enough to turn a decent gain into a long touchdown.